Freudian slips are slips of the tongue that seem to reveal the speaker's secret thoughts. The most famous of these slips, in psychological circles, was analyzed by Sigmund Freud himself. Learn about how Freud connected incorrect Latin to a dark personal secret. Freud wrote about a case of a young man who misquoted a Latin phrase to him. It was from The Aeneid, when one character cries out for vengeance. The actual line is "Exoriare aliquis nostris ex ossibus ultor," which translates as "Let someone arise as an avenger from my bones," but the young man said, "Exoriare ex nostris ossibus ultor," or "Let an avenger arise from my bones." 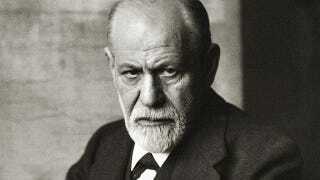 Freud felt that the suppression of the "aliquis," was telling; the man must have some bad association with it. He asked the man to do free association with the word, and got a string of words starting with relics and liquid, meandering through different saints, and then finally ending with a saint Januarius, whose blood, kept in a phial, was supposed to turn to liquid once every year. The man then confessed that his girlfriend had missed her period. Freud concluded that he had blocked out the word, associated with saints, calendars, and blood, that reminded him of the pregnancy scare. Other psychologists offered a slightly different analysis. During Freud's time, Latin was still a living, if academic and rarefied, language. Language changes over time. The man might just have been using a more simple, common, and modern Latin phrasing, instead of the relatively convoluted and rare phrasing that Virgil used. The most famous modern-day Freudian slip happened when Senator Ted Kennedy gave a televised address on education, during which he said, "Our national interest ought to be to encourage the breast... the best and brightest." The slip gained fame because it was filmed, and because it was accompanied by hand gestures that could be interpreted as "cupping." It also had legs because of the Kennedy reputation for being a family of womanizers. Freud would have likely had a field day with that particular slip.